Can I be honest with you? Sometimes life happens and things get super busy. Sometimes when I get home I have zero energy and all I want to do is get in bed. I know that I'm not the only one that feels this way sometimes so I try not to be too hard on myself. When it's "just one of those days" I try my best to show myself some self love and take a break. The thing about taking breaks though is the world goes on. If you're anything like me then you can't stand the thought of falling behind. That feeling is magnified in the world of business, blogging, and branding. One day off when you're unprepared can be the difference between a sale or no sale. We're all human and we need breaks. I've learned to to keep my blog and brand up and running even when I'm not. The easy way to do this is by repurposing your blog content. 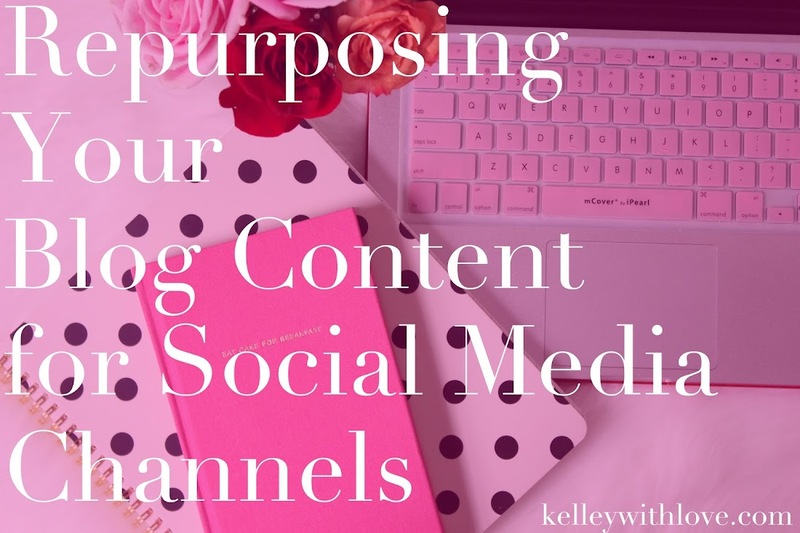 Check out some super easy ways to convert your existing blog content into content for six different social media channels. 2. If you use video's on your blog, share an attention grabbing clip of video. Tip: Always share the link you are directing your audience to in your Instagram profile. 1. Use standout quotes from your blog post and a shortened link to the post. 2. Share helpful tips paired with helpful links that you shared within the blog post. 1. Use the idea of a blog post as a question to improve engagement in groups or on business pages. 2. Share an excerpt from the your post and an accompanying photo. 2. Create mini tutorials and host them live on Periscope based on a blog post. Remember, your list consists of your VIPs and VIPs deserve exclusive content! Use your old posts to create extra help for those on your list. 2. Create workbooks to supplement your blog post content. Behind the scenes central! Why? Because everyone likes a good tour. 1. Share snaps of you showing your audiences some of your favorite posts. Which of these tips are you looking forward to implementing? If you love these tips, share this post and join the squad! Great tips!!! This is something I do frequently!!! Sign up to our newsletter to receive the latest posts and exclusive content.